For the first time ever, I made one of my mom’s recipes less healthy rather than more. This is even a recipe I previously adapted to be healthier. And I’ll probably go back to my healthier version (and share it with you) next time. But that doesn’t make this experiment less of a success. 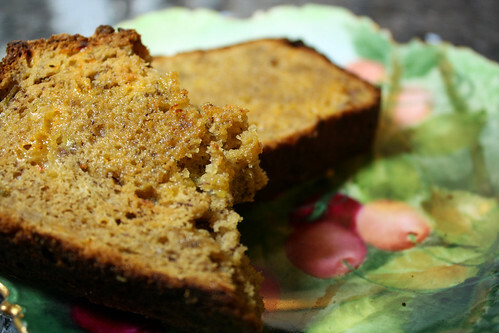 To understand this recipe, you have to know one thing about me: I eat cheddar cheese on top of my banana bread. Yes, I know I’m weird. Chris has told me so several times. My mom has conveniently forgotten that this is the way we ate it the entire time I was growing up. I know this because one of the times that Chris told me I was weird, I tried to get her to back me up about it being the way we always did it, and she denied it. That was how we ate our Swedish raisin rye bread, but our banana bread? No cheese ever touched it, if you ask her now. This entry was posted in Baking and Pastry, Bread and tagged bananas, Bread, cheese, Quick bread on March 17, 2009 by Jessica Petersen. This entry was posted in Bread and tagged Bread, Quick bread on February 17, 2009 by Chris. I figured that I would finally come out of my hive and talk about the sourdough bread I spent a week working on while I was snowed in before Christmas. As you may have inferred from other posts here, I’m basically cooking my way through The Bread Baker’s Apprentice, which I think has to be about the best book around if you want to learn how to bake professional quality artisan bread at home. I apologize if my photos aren’t as good as Tiger’s usual ones — these were taken before we started using better lighting. Because I’m cooking from a book, I don’t think I can reproduce the recipe in this blog without a copyright violation, so you’ll have to bear with me until I can come up with a few of my own recipes before you’ll see many ingredient lists. With that said, I love this cook book, and think it’s a necessity for any home baker’s bookshelf. This entry was posted in Baking and Pastry, Bread, Featured and tagged Bread, Sourdough on January 4, 2009 by Chris.